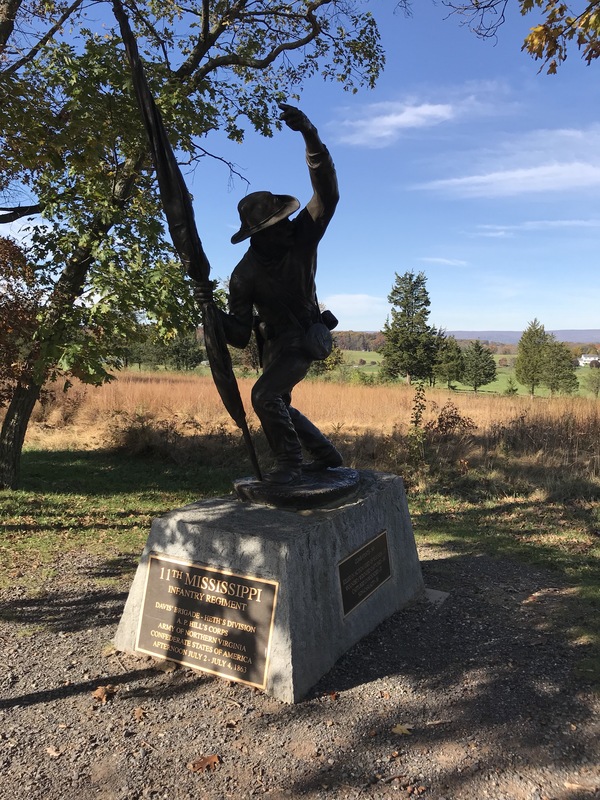 Today I drove home from Gettysburg after walking as an infantryman would have the battlefield in order to better get a feel for what the soldiers of both sides experienced. Over the two days I was there I walked almost 32 miles including walking across some of the most rugged terrain of the battle which gave me a far greater appreciation for the toughness, valor, and courage shown by the men of John Bell Hood and Lafayette McLaws’s divisions of the Confederate First Corps. Most of those men had marched between seven and twenty miles to get to their attack positions in the hot and humid weather of July 2nd 1863. If they even had them their shoes and boots were of relatively poor quality. As I walked seven miles with my hiking books and carrying a modern three day pack with about a 15 pound load I could only imagine the physical duress of those soldiers. To be sure I am 30 to 40 years older than most of those infantrymen, but still they had all marched between 200 to 300 miles before they even arrived at Gettysburg. The physical stamina required of soldiers at war is something that most people today cannot imagine. Not only have most never served in the military but far fewer have served in combat. I have, but I didn’t have to walk everywhere like these soldiers did, and while I came under enemy fire I never had to charge up a rugged hill under rifle and artillery fire as did the men of Robertson, Benning, and Laws brigades did at Little Round Top on July 2nd 1863, nor did I have to fight outnumbered in an exposed position as did the men of the Union Eleventh Corps north of town on July First 1863. I have always been able to admire the courage of any soldiers who fight in desperate battles, even those who fight for unjust causes. While I consider my service in Iraq to been the high point of my military career, I have come to see it as an unjust, and illegal war of aggression that under the Nuremberg codes could easily been declared an unjust war of aggression in which our political and military leaders could have been tried and found guilty as were men like Herman Goering, Alfred Jodl, Wilhelm Keitel, and Albert Speer. Speaking of monuments I write about the Confederate monuments at Gettysburg another time. Compared to the Union monuments they are few, and only two,that of the 11th Mississippi, and the 3rd Arkansas on Seminary Ridge are actually dedicated to specific units, the others are quite generic and convey mixed political and ideological messages which often demean the sacrifice of their soldiers who died on that battlefield. Once again I will defer writing about those messages until later, but as I walked Seminary Ridge and read each one I was stuck with the stories that each monument told. So anyway, tomorrow begins a short work week for the Veteran’s Day holiday, a day where we honor all who served our country in peace and war. I usually get a bit melancholy over this weekend as I think about my friends and comrades that I served with over the course of my thirty-six year career in the Army and Navy.